San Juan Mayor Carmen Yulin Cruz Soto speaks on a panel about Hurricane Maria at the annual Latino Political Summit in San Juan, Puerto Rico, Monday, Jan. 14, 2019. The mayor of Puerto Rico's capital announced Friday that she is running for governor of the U.S. territory. 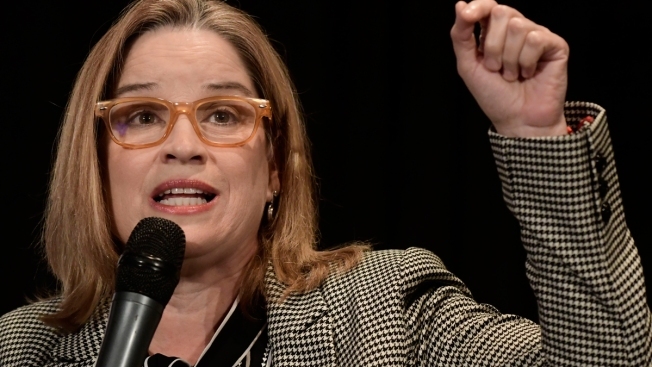 San Juan Mayor Carmen Yulin Cruz is a polarizing figure who became an outspoken critic of U.S. President Donald Trump after Hurricane Maria hit in September 2017 as a Category 4 storm. "Trump and his followers here and over there clung to the idea that everything was fine," she said during her speech to supporters as they clapped. Cruz, who was a nominee for TIME Magazine's 2017 Person of the Year, said that if elected, she plans to hold a constitutional assembly to decide the future of Puerto Rico's political status. Cruz also said she wants to eliminate a federal control board overseeing the island's finances and allow government agencies to declare bankruptcy if needed, among other things. Puerto Rico is mired in a 12-year recession and trying to restructure some of its more than $70 billion public debt. Cruz is a member of the Popular Democratic Party, which supports the island's commonwealth status. She will face Puerto Rico Gov. Ricardo Rossello of the pro-statehood New Progressive Party in general elections of November 2020. Rossello is seeking a second term.